The increases came despite 2017 having had the highest output of hydroelectricity — the state’s cheapest source of electricity — since 2011. Electricity prices in the rest of the United States outside California rose two percent, the same as the rate of inflation. 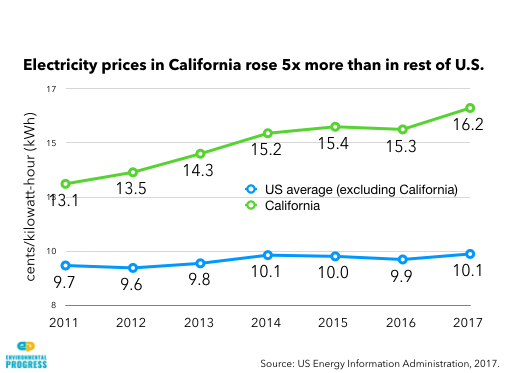 Between 2011 and 2017, California’s electricity prices rose five times faster than they did nationally. Today, Californians pay 60 percent more, on average, than the rest of the nation, for residential, commercial and industrial electricity. High levels of renewable energy penetration make electricity expensive around the world, not just in California. As Germany deployed high levels of renewables over the last 10 years it saw its electricity prices rise 34 percent. Today, German electricity costs twice as much as that in neighboring France. The rising cost of electricity in places with increasing penetration of intermittent renewables was predicted by German economist Lion Hirth. He found that the economic value of wind and solar must decline significantly as they become a larger part of the electricity supply. 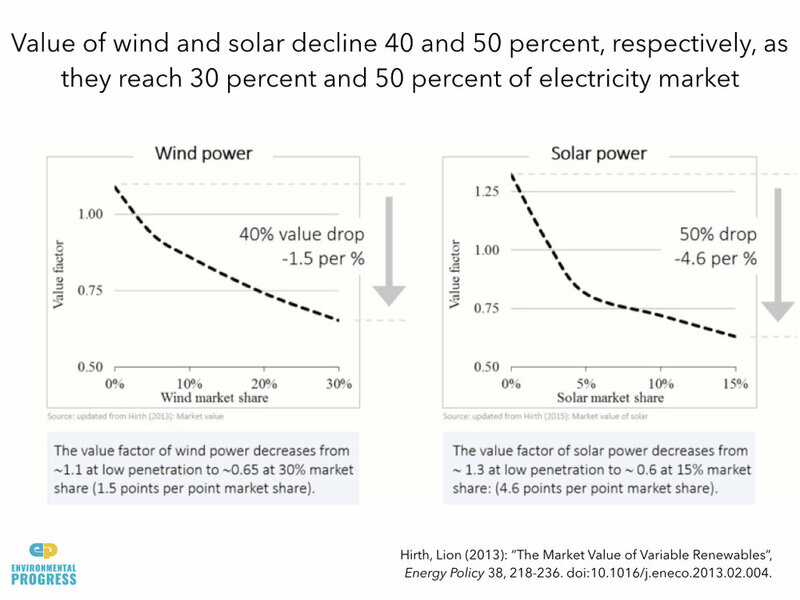 For example, the value of wind on the European grid drops 40 percent once it becomes 30 percent of electricity, Hirth finds, and the value of solar drops by half when it gets to just 15 percent. As wind and solar capacity climbs, the returns of usable power diminish because of increasing curtailment during surges that the grid cannot absorb. More and more intermittent capacity has to be pushed onto the grid to get less and less additional renewable electricity. The dynamic of soaring overcapacity and falling prices is the inevitable result of the fundamental inability of intermittent wind and solar generators to efficiently match supply to demand. The burden of higher cost electricity and benefits of renewable energy subsidies fall unevenly on Californians. Between 2007 and 2014, the highest-income 40 percent of California households received three times more in solar subsidies — valued between $10,000 and $20,000 per household — as the lowest-income 40 percent. California households with over $100,000 in annual income benefitted from energy efficiency subsidies at twice the rate of households whose income was under $50,000.